Look carefully, friends, at this magnificent piece of machinery. Look on it, for it is gone. Being a rural land owner is changing me drastically. Iâ€™m now the proud 1/4 owner of a TRUCK! And Iâ€™m obsessed with it. I had no idea how cool it is to own a real, live WORK truck. 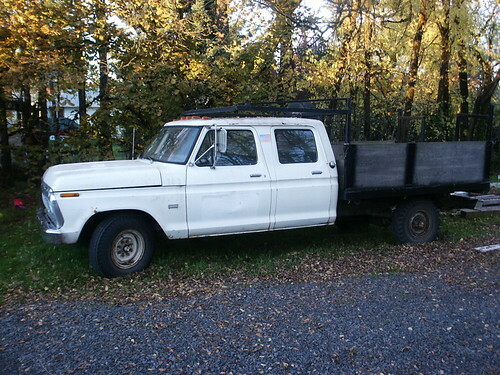 Itâ€™s a 1973 F350 flatbed-but the best part of all is itâ€™s got a crew cab. A CREW CAB! 4 doors of massive steel. I can haul anything, anywhere, with 6 people in the cab. We got a steal on this thing from an old guy who had it sitting in his orchard. But a year and a half later…a brake job, water pump, starter, alternator, carburetor, and 4 tires later…after running out of gas twice and stalling once (and that’s just ME)…we decided it was time to part with the truck. I’m actually more interested in learning more about your journey into rural life and intentional community. Is that a possible blog topic?